Our classic microfiber furniture protector is better than ever! Crafted for quality, this soft, thick recliner cover features a new quilted pattern, straps to secure it in place, and pockets to store chair-side essentials within reach. It provides the same great protection, with a water-repellent design to protect your furniture investment from spills and stains. specify color: burgundy, beige, sage or chocolate. Seat measures 30 1/2” long x 23” wide; back is 48” long x 23” wide. 100% polyester for easy care. Machine wash. I bought two and was very pleased that the color matched my chairs and the item fit well. I also like that they are washable. I am very happy with this wash-and-wear cover for my recliner. The strap around the back of the chair helps to keep it from sliding down. I have already started sending out my cards. I placed my mom and a card and empty chair in her room so she could read it. Protects furniture from cat hair and is easily vacuumed. I like this purchase. Fast service too. Put it on my lounge chair. It is nice looking and I like the side pockets. Easy to put on and take off for washing. Nice quilting makes it super compfy. I'm ordering another one. I have two for my couch and two for my recliner. One set is sage and the other is burgundy. I rotate them mm and it gives a different look to my couch. They wash up so well, are easy to change and stay on really well. 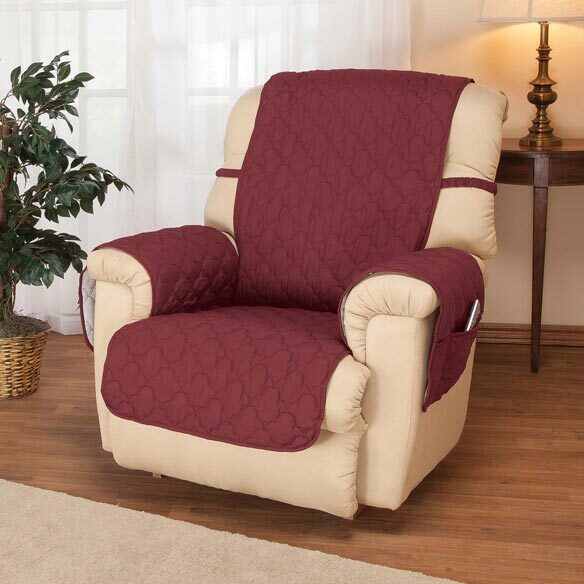 This recliner chair cover fits my large chair very nicely. Easy for laundering. I love what this cover does for me! A wonderful piece of protection for an expensive chair, especially during the hot summer months. I love this product. I have 2 cats who like to sleep on the furniture. I had covers for my couch and loveseat, but I was having a difficult time finding one for my new recliner that I just bought. This one is a perfect fir, and I love the color. I am very pleased with the chair covers, So please that I bought the couch cover and another recliner cover. Love these covers. They stay in place and protect our chairs. Easy to wash and air dry. I would buy covers again. These are nice covers and hopefully they will last for years. The sage color is good. Pockets on both side is a nice feature. It doesn't stay perfect on the chair no matter how much you tuck it in. It serves the purpose to some extent in serving the wearand tear on my recliner. I would buy this chair cover again. It fits. This recliner cover is working great so far. The fitting tips that came with it are very helpful, especially the one for rolling up magazines and putting them in cracks. I like the cover, I just wish it would stay put better, I have to re-adjust it after I get up, the arm covers & back keep getting pulled into the seat when I sit down. In any case, it's prolonging the life of my recliner. I am buying another recliner cover to use while washing one. 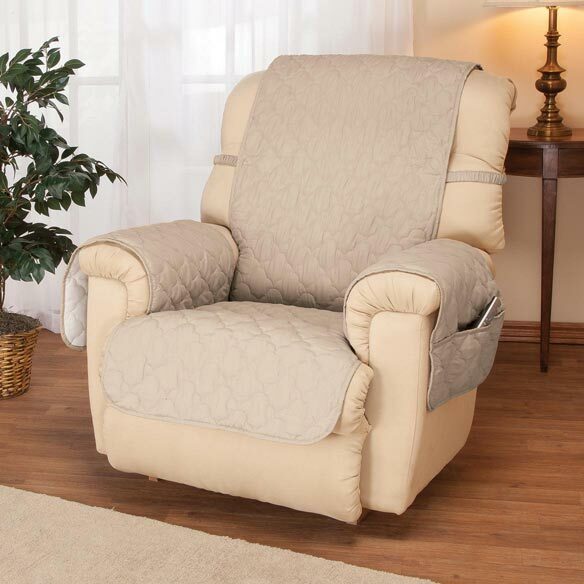 It works well for my husband's big man recliner although the flaps to tuck in could be a little longer or made with some sort of weight on the ends to help keep them tucked in. Very easy care. Dries fast without a dryer. We also like the pockets on both sides. That is nice for the many techy remotes, etc. that my husband uses. He also likes to eat in his chair and this protects the upholstery. Nice fabric, allows for easy animal hair clean-up. Seems to fit snugly around chair back. Color is very good, but the seat area is very skimpy and does not allow for the tuck in flaps to be tucked in, otherwise a nice product. The fabric on our chairs is faux leather and very slippery, so these covers don't stay in place very well. They are better than nothing but not the best answer to our needs. They slip and slide as we sit down and stand up and constantly have to be retucked. Even the attached tabs don't help. Not a promised in ad. Overpriced. Taking it to the post office tomorrow to send back. I would purchase this if it had pockets on both sides. Have a shoulder surgery patient who had surgery on left side. You only show pockets on left body side so that doesn't help us at all. If you have pockets on other side, you don't say so and I'm not going to order if I don't know. Disappointed. The OakRidge Cover was a disappointment. It is so lightweight and did not stay in place and looked very cheap. We returned the cover via USPS at a cost of over $7 for a refund. Miles Kimball deducted over $8 from the purchase price and said it would take 2 billing cycles to get that "refund". It cost us a total of over $15 to return it. Will think twice before ordering again from Miles Kimball. this cover is perfect for my husbands lift chair. stays in place and love the side pockets. I would recommend for any one that needs a protective cover for an elderly person. Need this for my leather recliner to protect it from my dog scratching the surface. I bought 2 couch covers and they are really nice. Fit well and wash well. Bought a new recliner so want to protect it as well since I have several cats. will fit my new recliner perfectly. It was a larger size and had the color I wanted. Material and pocket on the arm cover. Love the straps to keep the back in place so it does not slide down. we needed covers for our new chairs and these seem to fit the bill!! 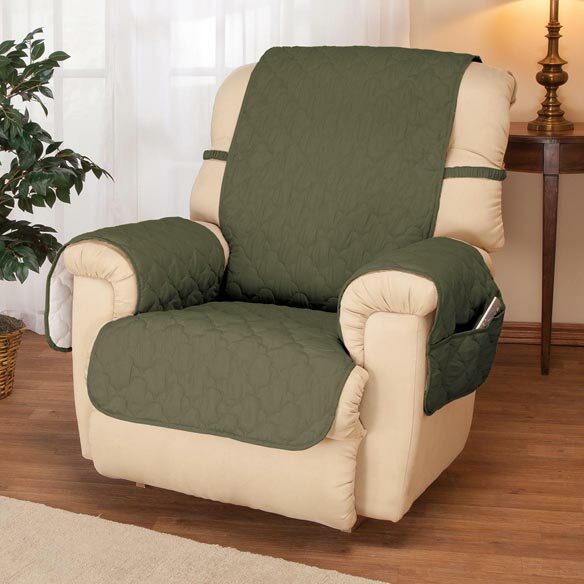 I just bought a good lift-chai/recliner and wanted a good cover to protect the fabric. This one had the features I wanted. Looked like it would fit a larger leather recliner. I want a full recliner protector with pockets. My recliner arms are narrow and remote, etc slip off. This appears to be good material and nice color choices. I have a new recliner and I like the idea of having a cover on it plus a place to store remotes etc. The main reason I got this one was the storage, plus it the reviews were good. I love that these are washable and have the strap to keep them on. Of course, I have not seen it yet, but I liked the color choices and the pockets in the side. My husband really wanted a recliner cover, so I thought the pricing was good and hope this one works out well for him. Have 2 new recliners and want to protect them. To cover a recliner my husband sleeps in. hopefully it will protect an expensive chair! Because my husband is a slob. I was looking for a cover that will not slip continuously when getting in or out of the chair. This cover had many good reviews. Hopefully I'll agree and I'll be able add my review after it arrives and "if" I am a satisfied customer. It had 5 stars and it looked identical to my wishes. are pockets on both left and right side? BEST ANSWER: The pockets are on both sides. is it too warm material? BEST ANSWER: We haven't noticed it being too warm...It looks nice, fits well and is comfortable. In fact, we are thinking of getting a couple more in the near future. i found the material just right. Had a fuzzy one before that was too warm but this worked really well. How far in the back it goes? How do he back straps connect? They are loose on my recliner. No adjustment if you can tie somehow you are golden. Company did not make it to fit all recliners. Seat measures 30 1/2” long x 23” wide how about the arm covers what isze are they? BEST ANSWER: Thank you for your question. The arm covers are 16.5”W X 27.5”L. We hope this information will be of help to you. How can I order this product if I live in Australia? BEST ANSWER: Thank you for your question. Click add to cart then in the cart click ship internationally. We hope this information will be of help to you.